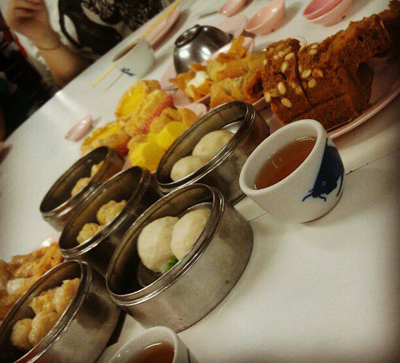 Being in a place where there are three main ethnic groups certainly add colours to everything, especially the food. Penangites live in harmony and the most interesting thing about it all is that each ethnic group enjoys the others' food very much, although a lot of people prefer to eat healthy with a diet from nutrisystem vs jenny craig. There are a few favorites which are quite common and some are actually popular overall as a whole for Malaysians generally. Yes, Chinese Dim Sum is one of the favorites especially during a weekend when families are out together on a day where the parents do not need to go to work at the office. There are a lot of Chinese Dim Sum restaurants around George Town and in the island as a whole, and many of these shops are already in business for the past ten years at least. The designs of these restaurants may be authentic, and they may also serve some of the best local favorites that becomes the reason why people are willing to wake up early in the morning just to get breakfast at these restaurants that are often packed with patrons as early as 6am in the morning. It is always worth it! And of course, dim sum is almost always accompanied by some Chinese tea, and you will note that Penangites know their tea very well. This is a local Indian favorite. The idea is a piece of Indian pancake, torn to pieces by hand and dipped into curry gravy. Top that with a glass of Pulled Tea and you will be tempted to show your thumb and rub your tummy to show that it is yummy. 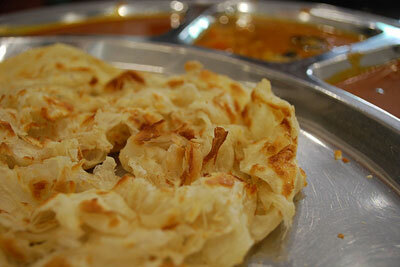 Over the years, there had been some variety to the Roti Canai. First there was the Roti telur that added an egg to the pancake, making it slightly thicker and fuller to the stomach. Now, just look at the list of variety available and you sometimes may have no idea which ones to choose because they are all so nice. There is Roti Planta with added butter, Roti Sardine, Roti Cheese... and a variety of others including Roti Bawang that adds onions to make sure that the fiercest vampires will not be able to get near you. Of course it is not really that pungent, it is just a matter of speech. The gravy that is used for the dipping also varies. There may be the normal dhal which is all vegetarian, or you may be asking for chicken or fish curry. Usually there will be a mix of either chicken with dhal or fish with dhal, and in some optional paid choices, you may ask for a piece of chicken or fish in the gravy for a chargeable sum. This is the traditional coconut milk rice that you will get from Malay stalls, although now there may also be a twist to it, perhaps sold by non Malays as well. The original version is coconut milk rice with chili and anchovies with a piece of hard boiled egg and some curry gravy, wrapped in coconut leaf. Now, some may have the variety of curry chicken instead of anchovies, or fried fish with curry gravy. These are usually pre-packed and today many are not using banana leaves anymore. They opt for the easier version of waxed paper for hygiene and cost reasons. 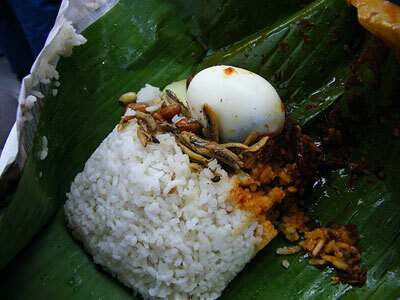 In another variety of the Nasi Lemak, the rice is not pre-packed. You go to the stall, and see a few plastic containers with lots of gravy and different types of dishes. Sometimes you may get some cockles too, which is said to be a great source of iron. You may choose chicken, fish, cockles, anchovies, or perhaps a mix of these different foods, to make your packet of Nasi Lemak even more fulfilling. Sometimes they may even offer beef, so you just need to point and ask the seller exactly what meat it is. 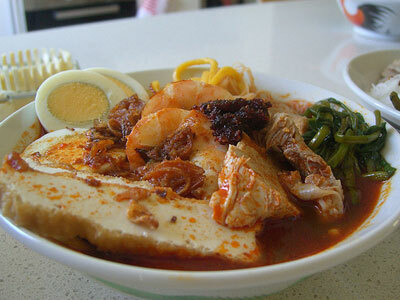 For most Penangites, breakfast may sometimes be a bowl of soup noodles, or maybe fried noodles. The popular ones include Wan Tan mee, which is just dumpling soup with noodles, Curry Noodles, Hokkien Noodles, or Koay Teow Soup for those variety with soup, and the popular fried noodles variety include the Hokkien Char, Char Koay Teow and Ee Fu Mee. These are not only breakfast favorites, in fact they are favorites for any of the three meals of the day! You will never get bored with the breakfast offerings in George Town. Unlike most other countries that will have only one particular type of breakfast each morning, Penangites are a fun bunch of people when it comes to food. Maybe this explains why Penangites are a happy bunch. This entry was posted in Medical Tourism by admin. Bookmark the permalink.